He has wonderful favorits. The shrimp look yummy! I have been looking at a number of recipes with shrimp lately. It may be time to try one out. Looks delicious~! 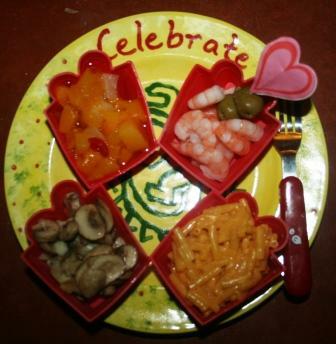 Why would not any kid clean up their plate when they see this in front of them. Tracie got the Curious George game at Stuff Ect. $1.40. My kids are hit and miss on the mac and cheese too! lol I know some families that that is all they serve. I couldn't get by with that. Mine would prefer the M&M's for sure! I am so impressed by what he eats. I also love you new look on the blog! Hey! Fancy new theme! I love it! My son would love the mac and cheese! I love things that make meals special! I love your new design and just thought I would pop over real quick and take a look. Very cute! !